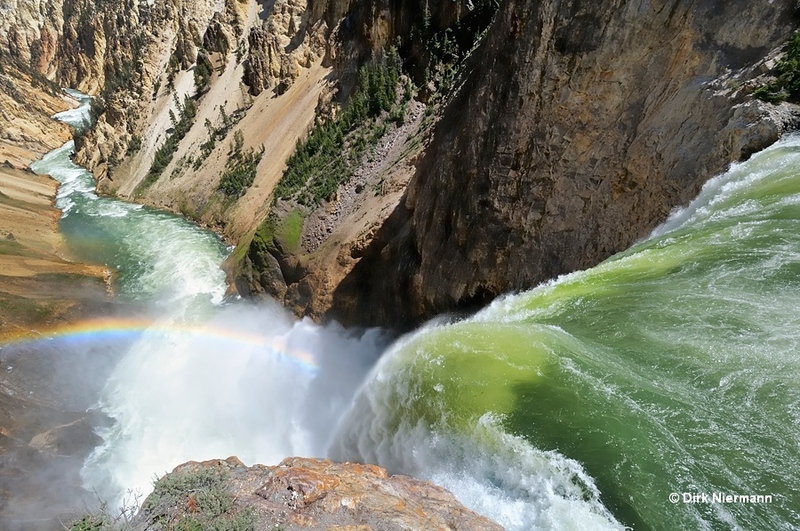 The Grand Canyon of the Yellowstone does not only impress with its length of 38 km (24 miles) and a maximum depth of 360 m (1200 feet), but even more with its amazing play of colors. The colors in the range of yellow through pink can mostly be attributed to formation of iron oxides by hydrothermal alteration of rhyolitic rock. Approximately 590,000 years ago these rocks were deposited as lava by the Canyon Rhyolite Flow and subsequently eroded by a combination of hot steam and gases, earthquakes, icing, and other natural forces. There are some locations in the canyon, where the hydrothermal influence is particularly evident. Downstream of the Lower Falls the canyon cuts through a buried primeval geyser basin at and above the level of Yellowstone River. 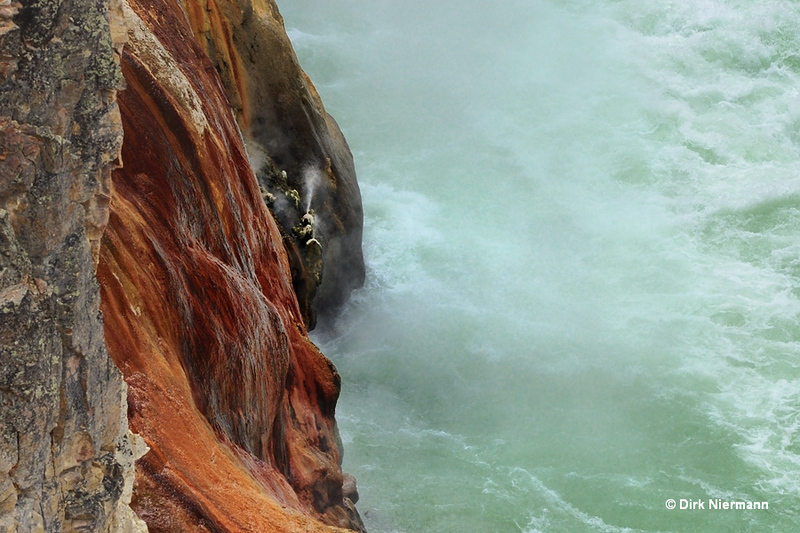 Even today many hot springs and also geysers line the steep river bank, and some are to be found in the river bed. Just as the depths of the canyon everywhere else, these thermal areas are closed to the public and would otherwise also be hard to reach. One of the best viewpoints for the Lower Falls section of the Grand Canyon Geyser Basin is the steep Uncle Tom's Trail at the south rim. Springs and geysers are easily recognized by their steam plumes or rusty orange runoffs. To the right of the section shown on the next picture sits Red Rock Geyser directly downslope of Red Rock Point. It has been observed to spout 4.5 m (15 feet) high. 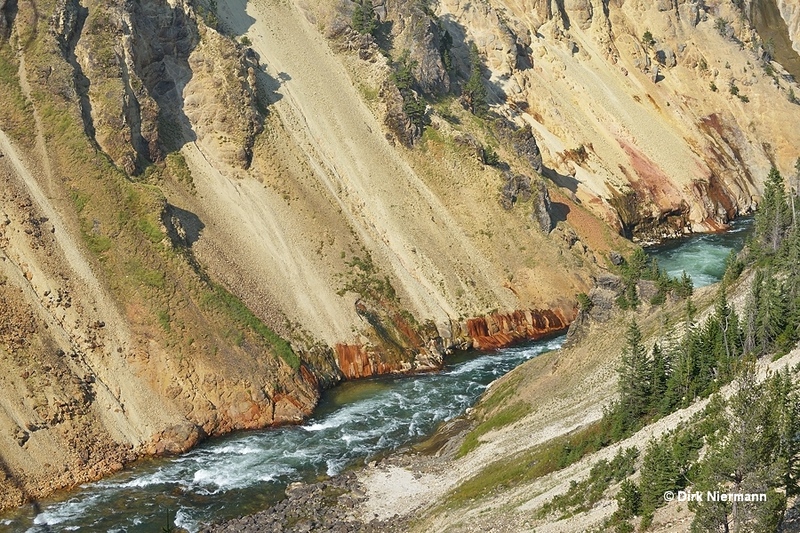 In the further course of Yellowstone River, Artist Point is an excellent viewing platform not only for the colorful rock formations but also for geysers and hot springs. Here the walls of the canyon are tightly occupied by thermal features. Approximately 200 m (660 feet) in western, upstream direction a noteworthy group of whitish "iced" cones appears well above the water level. Despite the large distance from the overlook the emission of fine spray or steam is clearly visible against the dark cliff of the south rim in background. 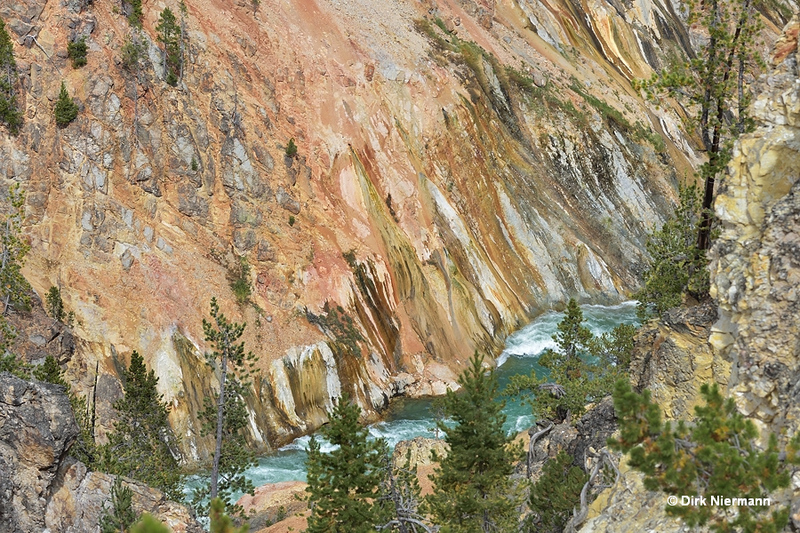 Moreover, all the rock face around the spouters is tinted in deep orange-red by percolating hot water. 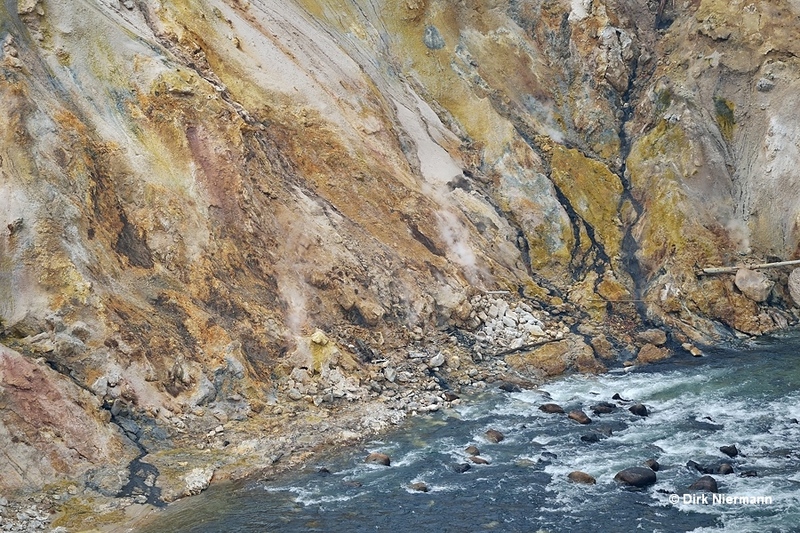 Directly across the river from Artist Point a whole series of hot springs are ranged side-by-side along the northeastern canyon wall, and their discharge water leaves orange, yellow, brown, or white colored marks on the cliff. Sometimes you can spot some vents spouting or steaming. 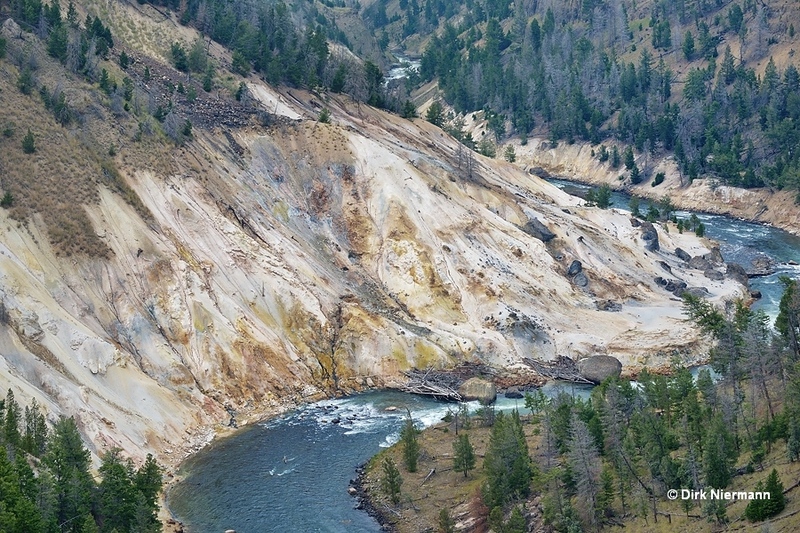 Another location to observe hot spring activity is the Calcite Springs Overlook above the lower Grand Canyon of the Yellowstone. It is only a few minutes drive from Tower Junction. The name "Calcite Springs" can be traced to the appearance of the mineral calcite in the vicinity of the springs. Similar to Mammoth Hot Springs they deposit travertine (limestone) instead of the commonly found siliceous sinter. The Clacite Springs went dormant in the late 1990s, but returned in 2004. 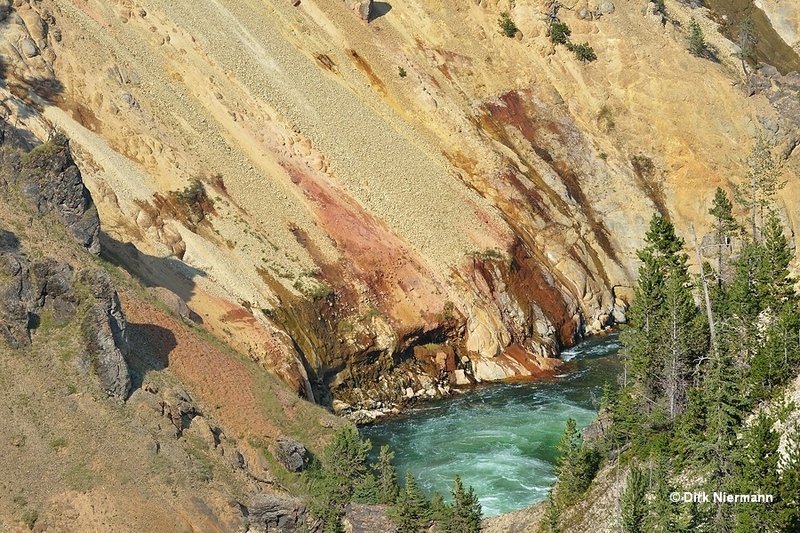 As with the springs east of Lower Falls, the close-up reveals coloration by iron oxides in different shades. A quite conspicuous feature of Calcite Springs is the discharge of a mixture of hot water, gray sulfur minerals, and black, oily organic fluids into the river. Besides the organic fluids also black filamentous bacteria from the genus Sulfurihydrogenibium have been found in the effluent channels, which prefer pH 6-8 and temperatures between 60 °C and 75 °C (140-167 °F). Even a new species was detected at Calcite Springs, named Sulfurihydrogenibium yellowstonense.